“I am the rose of Sharon” (S.S. 2:1). The rose is the queen of flowers. Some flowers are fragrant but not beautiful, and some flowers are beautiful but have no fragrance. The rose is both beautiful and fragrant. As the Bride of Christ, our life must be one of unique beauty, fragrance and sweetness. “Thou art all fair, My love; there is no spot in thee..There are threescore queens, and fourscore concubines, and virgins without number. My dove, My undefiled is but one,” says the Bridegroom of the Bride (S.S. 4:7; 6:8,9). Everywhere around the rose there are thorns. When the wind blows the soft petals of the rose are pricked by the thorns. What does the rose give in return? It gives sweet fragrance. We live in the midst of a crooked and perverse people, people who prick and hurt, people who cannot love; we need to perfume their lives with the aroma of forgiving love and kindness. The oak tree lives for a thousand years but it has no beauty or fragrance. The rose lives for only a short period but it is beautiful and it gives good fragrance. It matters not how many days we live but how we live. Our life, all our days, must be filled with beauty and fragrance. 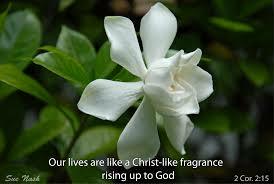 The Christian life is truly a beautiful and fragrant life, for it is the life of revealing Christ, of revealing Christlikeness to the world. “Now thanks be unto God which maketh manifest the savour of His knowledge by us in every place.” So child of God, Let Christ fill your life. Without Him you have no holiness, no beauty. Let Him shine out of you. The rose never has to go to the butterfly and bee. They come to it even if it is in a corner. When we are like the rose, filled with sweet honey, souls will flock to us to taste of God’s love, to taste of Christlikeness. Dear child of God, today you may be a thorn in the garden of God, the Church. However, our gracious Lord can transform you into a beautiful rose, filled with fragrance and honey – if only you will repent and return to Him.